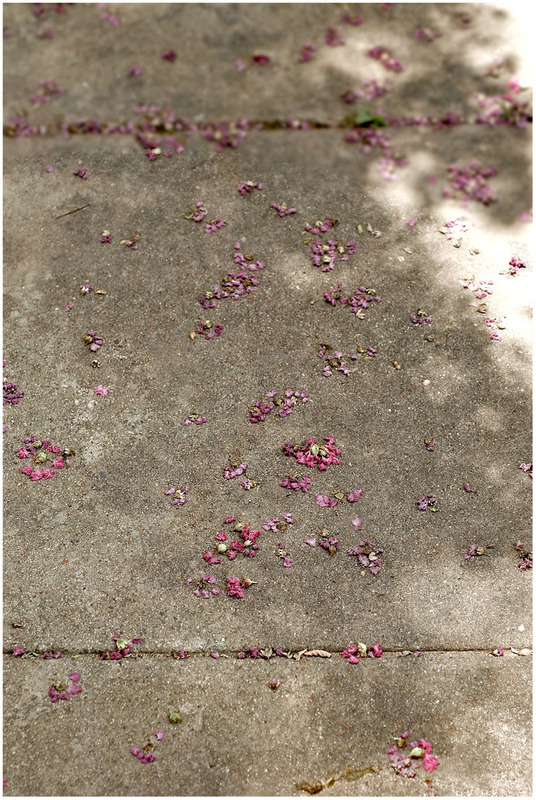 i like the way the blossoms fall into the broken places & cracks. i spell it t-h-a-n-k-y-o-u and e-x-h-a-l-e.
as leonard cohen says, 'there is a crack in everything, that's how the light gets in'. you have rare and sterling insight. you have a unique way of saying things right. And tonite I want to sabotage myself again and delete my blogs. This time if i do, i won't return. I'm just kinda tired of it all. cut myself down & sabotage me. Thanks for reminding me to look down and see the beauty lying at my feet. everytime I visit you here I am totally blown away by your imagination in your photography and your words. Hope definitely comes from broken places. Thanks! you see things others don't see. others don't look. like the other readers of your words, i smile, i thank you. I love the play of shadows and light, the shades of grey with the hot pink and purple and that spot of lime green up at the top left. Makes my heart so happy!